If your job has sent you to Plano or Dallas to attend a conference, you’re probably busy trying to get everything ready for your trip. In addition to planning your flights, and making sure you have everything you need for networking, you also need to book a hotel. This is usually the least fun part of the process. A lot of hotels are small, cramped, and full of uncomfortable furniture. Many hotels charge you to use the WiFi and many of the other amenities. Attending a conference doesn’t have to feel like a drain when you stay at a great hotel. Studio 6 in Plano is the best way to make your conference feel like a vacation. Our rooms are comfortable, we are conveniently located, and we have all of the amenities you need. Contact us today to book your room in our extended stay hotel. 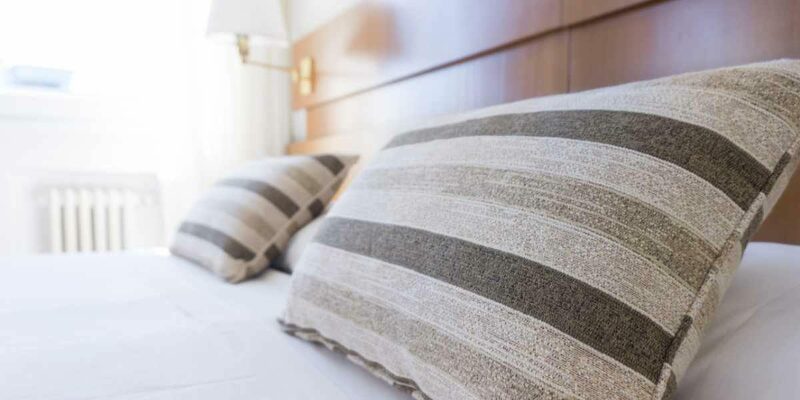 Regular hotel rooms very quickly start to feel like a jail cell, especially if you are cooped up in small groups at a conference, or at cramped tables during meals. At Studio 6, our rooms are large enough for you to be able to relax and to get work done. One of the main benefits of choosing to stay at our hotel is that every room feels much more like an apartment or a home than other hotels. Our furniture is comfortable, and each room has a full kitchenette which is great for making yourself a delicious breakfast in the morning instead of chocking down stale, cold food at your conference. 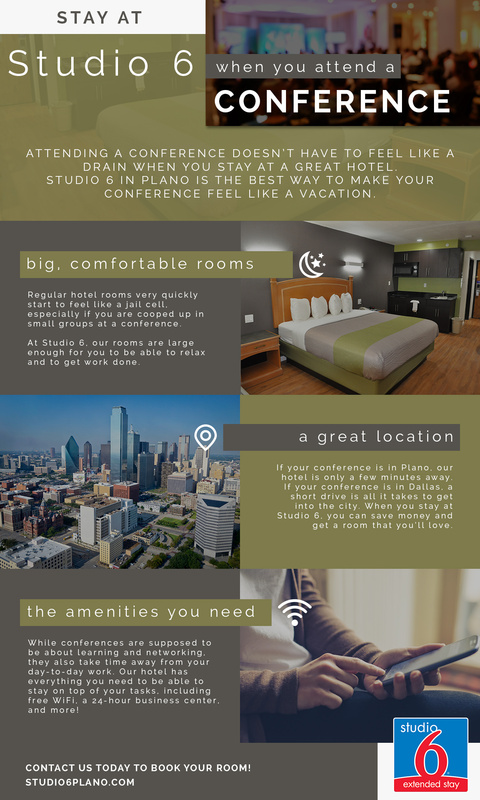 If your conference is in Plano, our hotel is only a few minutes away from nearly every location that hosts larger events, including several hospitals, colleges, and universities. If your conference is in Dallas, a short drive is all it takes to get into the center of the city. Staying in Plano for a Dallas conference can help you save money and avoid the hustle of the city itself. We are also close to many restaurants, bars, and other places to hang out with people from the conference. If you’d like to spend your free time outdoors, we’re just a few minutes away from some incredibly beautiful country that you’ll love to explore by yourself or with friends. While conferences are supposed to be about learning and networking, they also take time away from your day-to-day work. Our hotel has everything you need to be able to stay on top of your tasks, including free WiFi, a 24-hour business center, and more! With our on-site laundry facility, you can make sure that you don’t arrive home with bags full of dirty clothes. To unwind after a busy day, you can watch TV on the large, flat-screen television in your room, or stream your favorite movies or shows onto your computer, phone, or tablet. Contact us today to book your room! When you stay at Studio 6, you can save money and get a room that you’ll love.